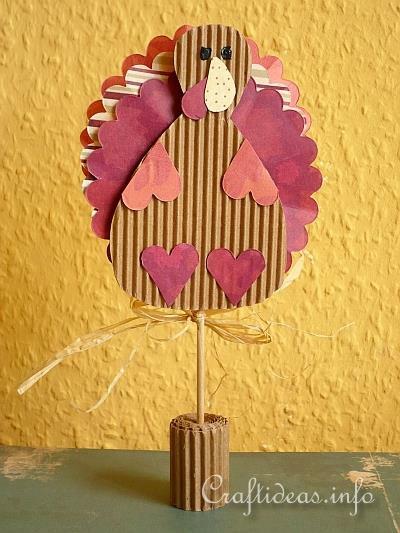 This turkey decoration is quick to make just using a scallop die along with autumn colored paper and pasting them on a turkey shaped body. You can increase the base size if necessary for more stability if small breezes cause your figure to fall over. 1. For the tail feathers, die cut 3 of the larger sized scallop on your Sizzix Bigz die. Fold these scallops each half way, and then turn and fold again to shape and sculpt them some. Now glue the scallops over each other, offsetting each new scallop as you glue it. 2. Print out the turkey body using this Turkey Pattern found on Craftideas.info for the Turkey Plant Poke project for kids. Decrease the size of the pattern so that the turkey has a height of 10 centimeters. 3. Glue the tail feathers behind the body as seen in the picture above. 4. The feet, wings and beak are created by die cutting scallops and cutting them to the shape of these body parts and gluing them on. 5. Add two dots of black paint as eyes for the turkey. 6. Cut a strip of corrugated cardboard measuring 3 x 35 centimeters and then roll it and glue the end. Insert the skewer into the middle of this roll. Glue the other end to the backside of the turkey. 7. Tie a raffia bow around the skewer and push up the stick to the bottom of the turkey.